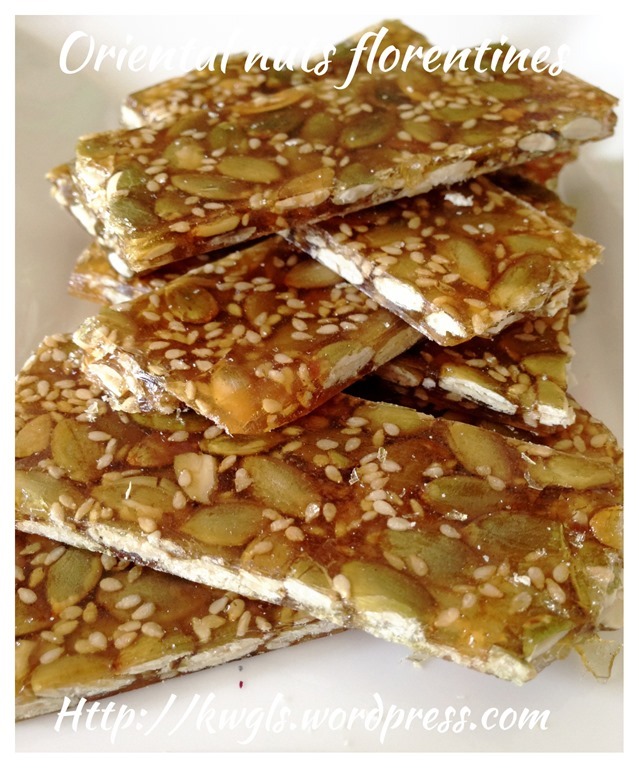 I do not know the name of this snack and I do not have the time to really find out the background of this well like crispy nuts brittle.. What I knew is that, at times people called it Bienetta Crisp or Florentines.. The name sound so alien to me … and a search of these recipes showed that a special type of sugar powder called florenta or bienetta flour is needed.. Most recipe requires to mix the nuts with these special flours and bake in the oven to let the sugar melts, become syrup and harden when cooled. 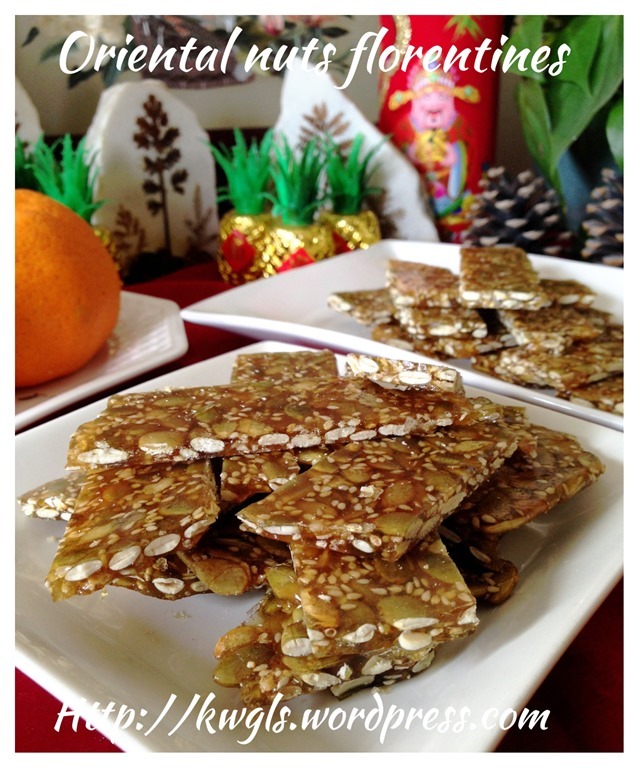 Looking at the transparent nuts brittle, I knew that it did not go far away from the Chinese traditional snack peanut sweets.. For the making of peanut sweets, I knew rather well.. 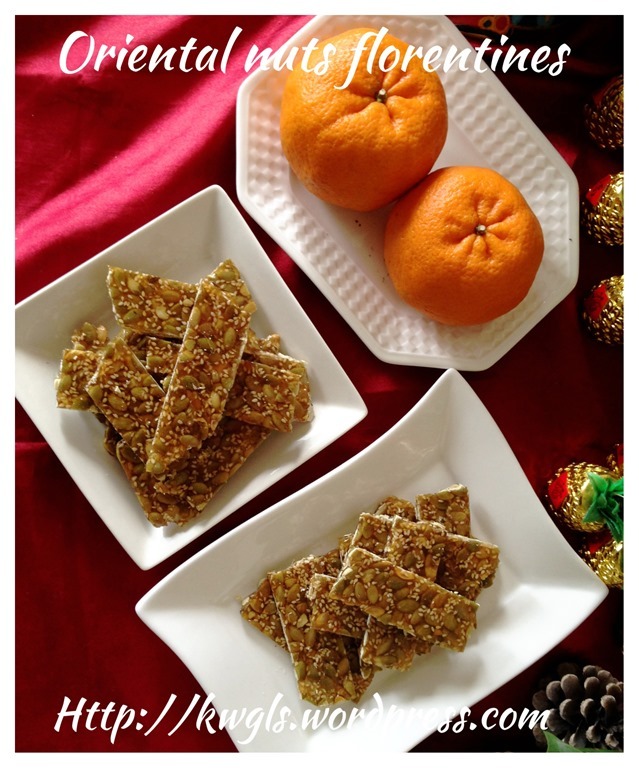 I came from a family of making confectionary and when I was young, I have seen these snacks being made.. To be more precise, the type of sugar caramelized snack which is crispy and sweet.. I am reluctant to go out and find these special flour, even if I found it, I presumed the price will not be cheap either. 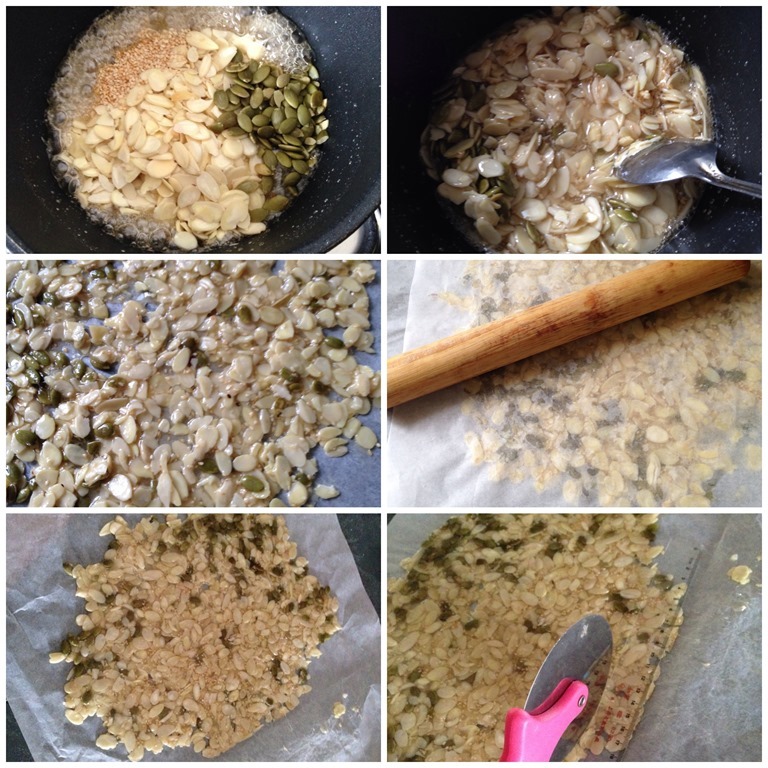 However, I knew the Chinese version of preparation which did not use oven and with one ingredients that Chinese snack like to use – maltose – a type malt syrup.. This wonderful ingredient appeared in many Chinese snacks.. Since I knew the ingredients, the next question is the proportion.. I have experimented twice. The first attempt is a failed attempt as I have inadequate maltose at home and it refuse to harden properly. It become a slightly chewy snack. 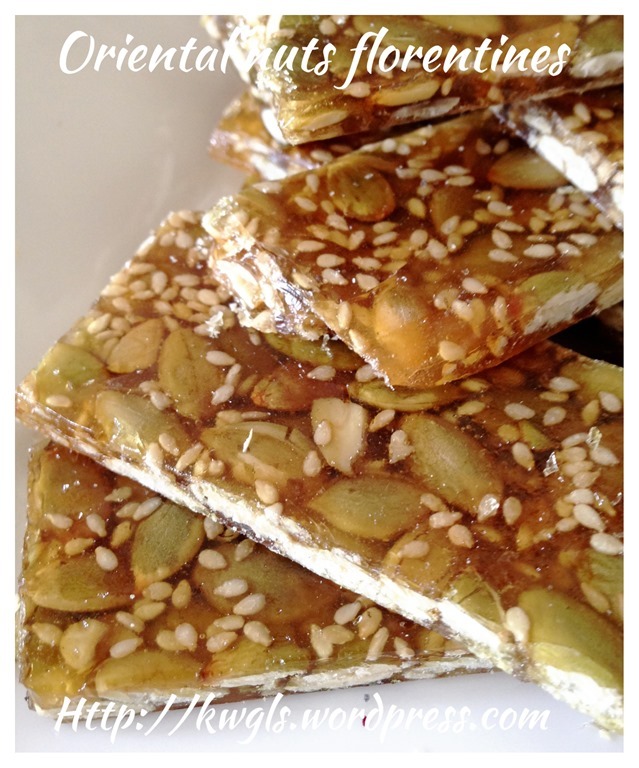 After I get a new bottle of maltose, I experimented again and it was a great success.. A crispy brittle type of nuts sweets.. 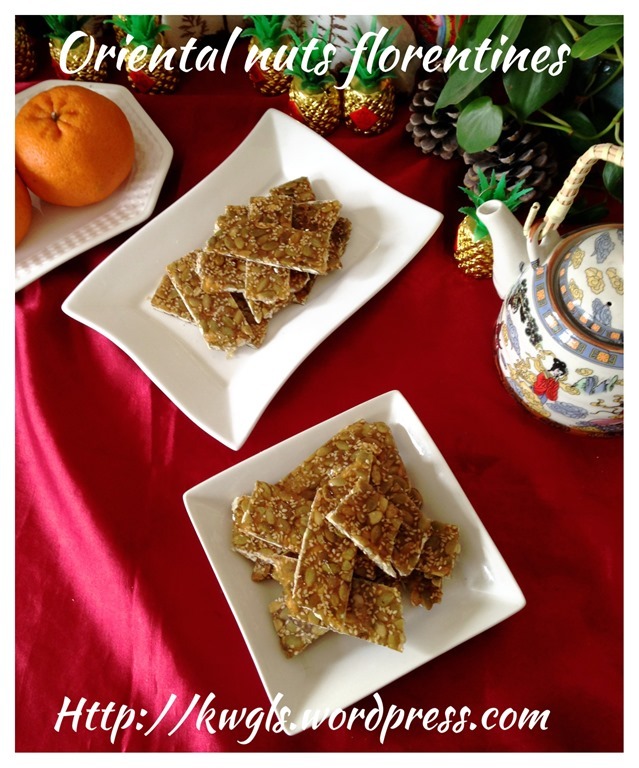 It is addictive and family members loved them very much. 2 cups of nuts of your choice.. 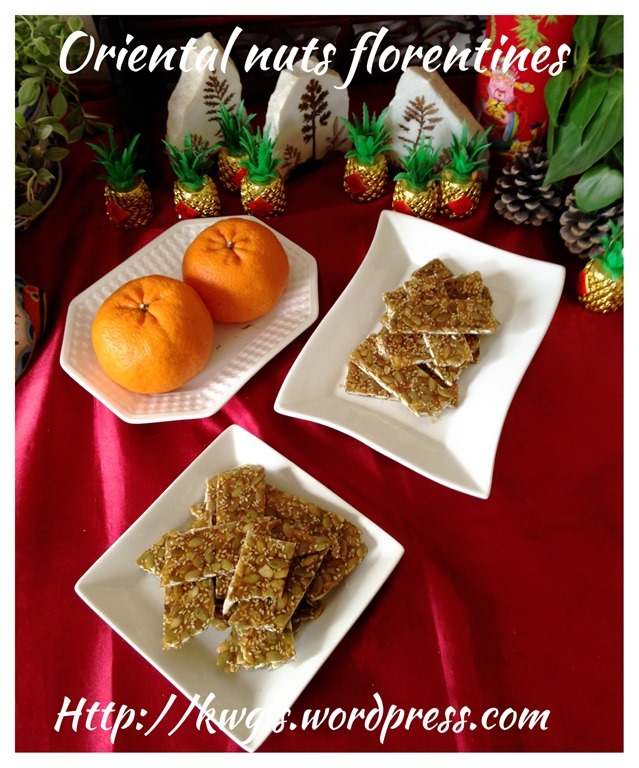 This illustration picture used sliced almonds, pumpkin seeds and white sesame seeds. 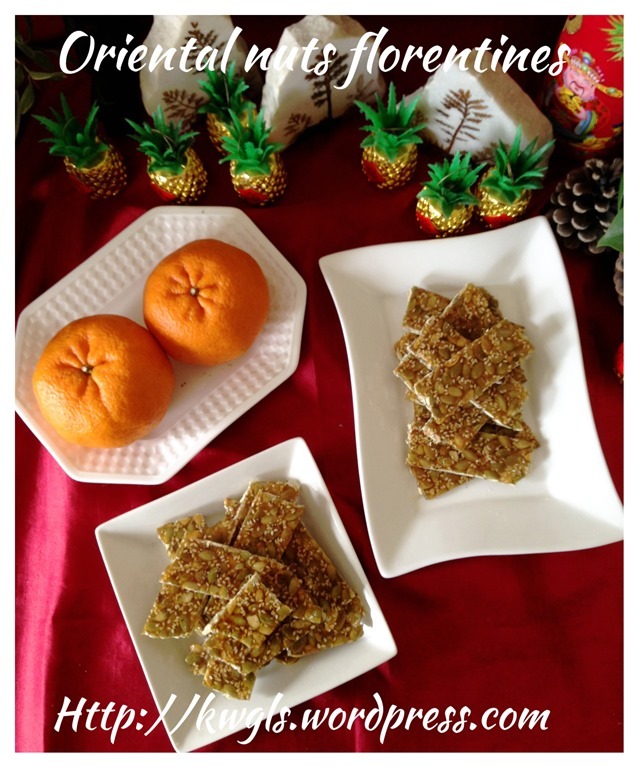 The final picture came from the second illustration which uses only pumpkin seeds and white sesame seeds. Feel free to change to your favourite nuts. Even peanuts can also be used. In a non stick pan, put maltose, sugar and water together and bring to boil under medium to high heat. Ocassional stirring is required. during this boiling process, you will start to witness the bubbles being formed. These bubbles will change in size from small and gradually get bigger. 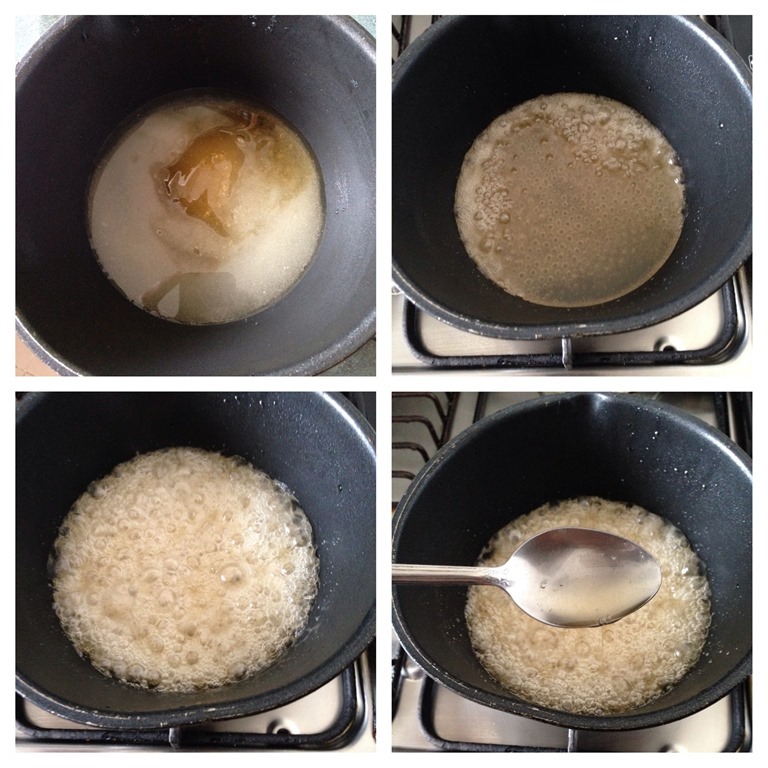 The bigger the bubble, the more sticky is the syrup as water vapour are evaporated leaving the thick syrup in the pan. To test the readiness of the caramelized syrup, take a small spoon of the syrup, place it in a metal plate and cool it using a fan. If after it cooled, a transparent piece of solid sugar is formed, the syrup is considered as done. While you are testing the syrup, reduce the heat to low to avoid over caramelization. 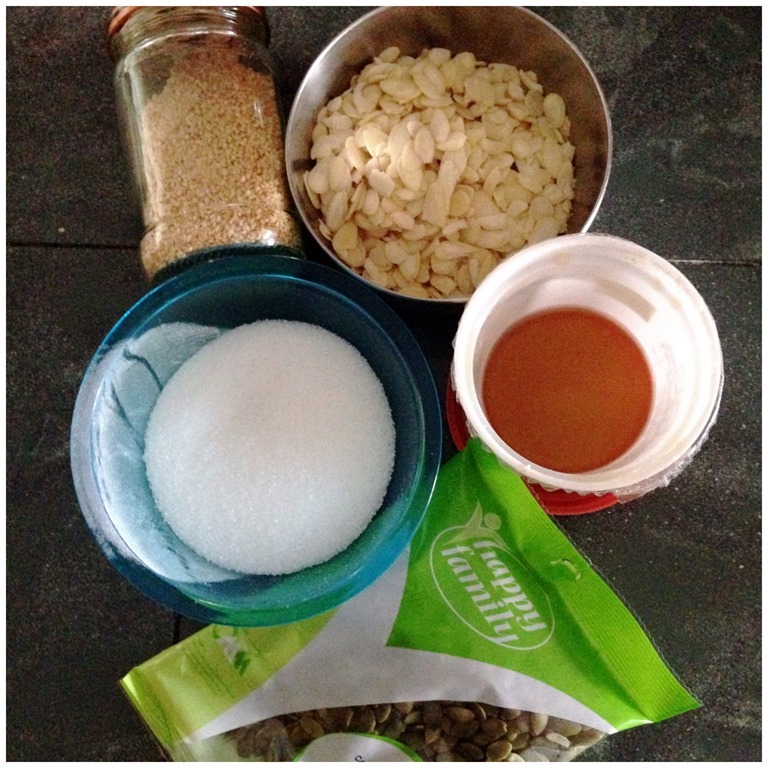 When the syrup is ready, off the heat, quickly add in the nuts and sesame seeds. Stir until well mixed. Transfer it to a piece of baking paper.and spread as thin as possible. Quickly put another piece of baking paper on top, use a rolling pin to roll it even. While it is still warm, use a pizza cutter to cut into the desired sizes. Once completely cooled, the sweets will become crispy and shall be stored in an air tight container. The entire process can be very fast and it is advisable that you get ready the baking paper, pizza cutter, rolling pins in advance. If properly caramelized, it will turn hard in a a minute or two. Once it turns hard, you will not able to roll and cut. Therefore, you will only have 1-2 minutes to get all action done. 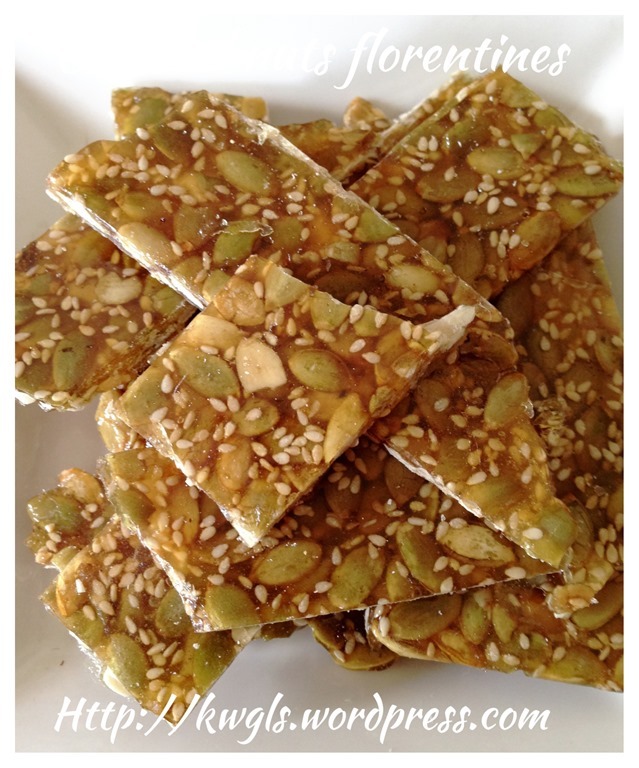 The critical success factor of this recipe is the sugar caramelization.. If you off the heat too early, the water inside the syrup will inhibit the crystallization of the sugar and you will have a thick syrup type of chewy texture. If it really happens, add a bit of water, re-melt the sweets and continue boiling until it can crystallize properly. 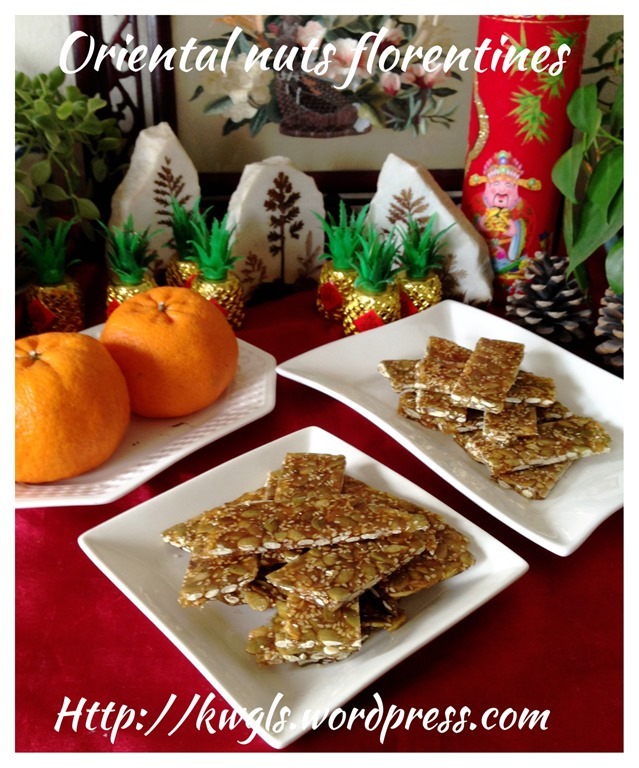 This shall be the last 2014 Chinese New Year snack recipe this year. 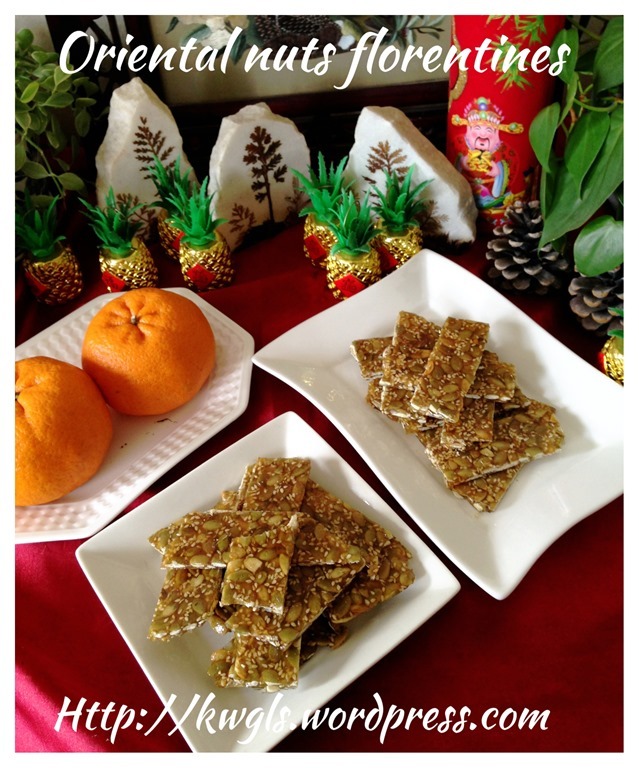 If you are unable to find florenta or bienetta flour, you may want to try this recipe. 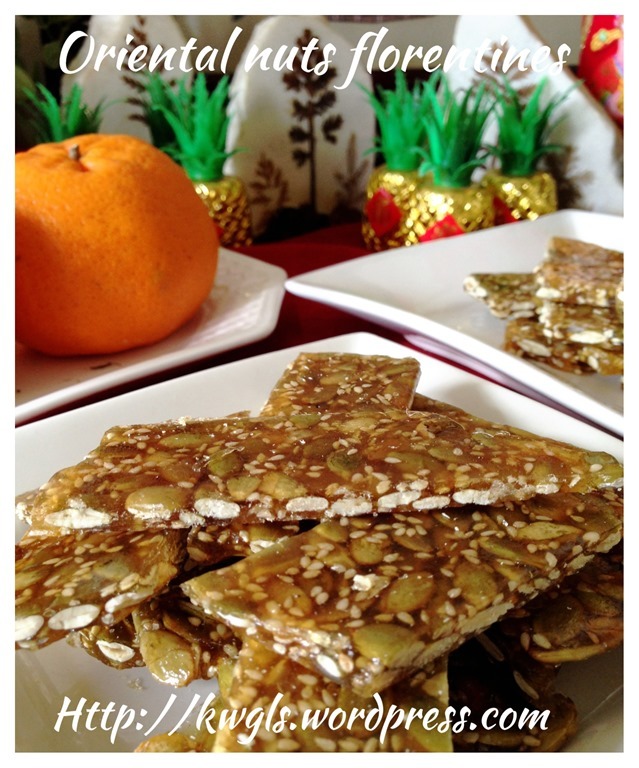 This entry was posted in Cakes and cookies, Chinese and Asian Cakes and Snacks, Chinese New Year 2014, Food Preparation Series and tagged 8, Almond crispy brittles, GUAI SHU SHU, Guaishushu, kenneth goh, postaday, 坚果脆片，杏仁脆片. Bookmark the permalink.